The Legendary shield, as per Halo: The Master Chief Collection's release. "Tremble as teeming hordes of invincible alien monsters punish the slightest error with instant death... again and again." "Your enemies outnumber you greatly and are hunting you down. Can you survive their onslaught?" "Death around every corner. Reload often." "Face insurmountable odds and an overwhelming enemy force. This is what legends are made of." Legendary is the highest and most difficult setting of Campaign gameplay in every Halo games to date, aside from the informal "Mythic" difficulty which is Legendary with all Skulls active in Halo games that feature them. The Legendary difficulty is also featured in Firefight, Skirmish, and Spartan Ops games. 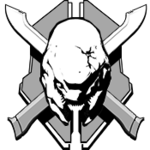 In the original Halo trilogy, legendary difficulty is symbolized by an Elite skull with a bullet-hole through one side, two crossed combat knives and a shield bearing the Marathon symbol, though the symbol is not visible behind the skull. 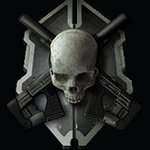 In Halo 3: ODST, the symbol is adjusted to a human skull with two crossed Suppressed SMGs in front of the same shield with the Marathon symbol, now slightly visible behind the skull. In Halo: Reach and Halo: Combat Evolved Anniversary, the original legendary symbol returns, but these games, along with future titles, lack the Marathon symbol on the shield. In Halo 4, the shield and the combat knives have been redesigned while the skull of a Promethean Knight replaces the previous skulls. Legendary is regarded as a significant challenge, even for veteran players. Overwhelming enemy firepower, superior enemy numbers, and increased enemy intelligence make up most of the challenge, but several specific changes, varying throughout games, also add to the difficulty. Most allies are practically useless aside from creating distractions. The player must play cautiously and conservatively to succeed, but even with appropriate tactics and practice, the player will die very often and may require some luck to succeed. The increased difficulty does not come without rewards; many details, such as pieces of dialogue, cutscenes, and music, can only be heard or seen on Legendary; in particular, most Halo games feature an additional scene in the ending cutscenes, which is only shown on Legendary, often referred to as "Legendary Endings". Halo: Combat Evolved, Halo 3, Halo 3: ODST, Halo: Reach, Halo 4, and Halo 5: Guardians feature such endings. Several achievements, challenges, commendations, and career awards reward players for accomplishing various tasks on Legendary difficulty in addition to the achievements for simply completing every mission on Legendary. In the first Halo game, the differences between Legendary and other settings is relatively numeric. The player does not face unique or different enemies yet they face many more enemies who are tougher to defeat and endure. Many of the same strategies that work on other settings work on Legendary in this game except that the player has to be extremely careful of his/her own weaknesses. This is where the Noob combo comes in handy, with use of the Plasma Pistol and M6D Magnum. Player shields are half their Normal resistance. A few hits from plasma will often drain them completely. Enemy shield resistance is doubled. Extremely weak health. One melee from an enemy in front of the player will often prove fatal. Player shields and enemy shields recharge faster - twice as fast as when on Normal difficulty. Elites: Twice as many Elites appear as on the Normal difficulty. Elite Majors are encountered at a ratio of about one of every three Elites encountered, improving enemy forces. An area that had two Elite Minors on Normal should have four to five Elites on Legendary with one or two of them being Majors. Their shields can take 28 rounds from an Assault Rifle before lowering. Grunts: Twice as many Grunts appear than on the Normal setting. Around half of the Grunts encountered are Grunt Majors. Enemy Grunts and Elites throw grenades frequently, much faster and almost always accurately. The grenade detonation timers are cut in half. Firing Rate : All enemies fire their weapons much faster and more accurately. In particular, Jackals will fire long streams of 10-15 shots with high accuracy. Jackals will also charge their plasma pistols much more often proving deadly in combat. Agility : All enemies move much faster and will rarely allow a player to stick them with grenades. Elites will often do their dodging maneuver immediately if hit, making it very difficult to make consistent hits on them to drain their shields. Stealth Elites: They are always encountered in packs of four to six with few exceptions. Flood: The Flood are now armed 90 percent of the time. Their deadly melee attacks will drain shields by half. Many more of them wield Shotguns and Rocket Launchers than before. Only a couple of Infection Forms can completely drain your shields, and an explosion from a Carrier Form can kill you instantly if your shields are completely or partially drained. Allies: Marines are virtually useless. They will constantly get stuck with grenades and most are easily killed by the enemy's increased rate of fire. Their returning fire only inflicts minimal damage on enemies. Their AI is increased significantly, still to little effect. Elite Zealots appear more frequently throughout the game. Incredibly, it takes 21 shots from an M6D Pistol to remove their shields alone. The player does not go through the controls section at the beginning of the level, the game assuming that anyone choosing the highest difficulty level has gone through it before. Instead, they will wake up and leave the cryo section immediately. This also occurs on Heroic difficulty. Johnson's speech changes in the beginning of the level. The player has immediate access to the motion tracker and Frag grenades. Upon entering the loading bay, 4-6 Elite Zealots will ambush the player and the Marines in addition to the standard waves of Grunts and Jackals which pass through the hallways. There will also be a couple of Hunters. The shotgun is no longer available early on in the game. The only way to pick it up is to kill a Flood combat form that was holding one or from one of the dead Marines from the third room with an energy bridge. The player only has five minutes to get to the Longsword fighter after destroying the Pillar of Autumn's engine core as opposed to the usual six minutes. The player will get to see the non-canon secret ending. The Living Legend achievement is awarded for completing the campaign on Legendary. The Brohammer achievement is awarded for completing any level cooperatively on Legendary. The Overshields are for Sissies achievement is awarded for completing the level The Pillar of Autumn on Legendary without picking up an overshield. The Walk it Off achievement is awarded for completing the level The Pillar of Autumn on Legendary without picking up any health packs. The Speed Reader achievement is awarded for completing the level The Library on Legendary in 30 minutes or less. The Leave It Where It Lay achievement is awarded for completing the level Two Betrayals on Legendary without picking up any other weapons. The Never Tell Me the Odds achievement is awarded for completing The Maw on Legendary with at least one minute remaining on the countdown. Both players have "linked lives". That is, when one of the players dies, both are sent back to the last checkpoint regardless of whether or not only one of them died (Possibly to prevent players from easily reaching the status of beating Legendary on their profile or to enhance it with the general knowledge of the above statement). This effect is similar to enabling the Iron Skull. Enemy fire or munitions have a faster velocity. Enemies will tend to use more powerful weapons earlier in the game or more often, such as Ultras and Zealots with Energy Swords, Grunts with Fuel Rod Guns and Needlers, and finally Brutes with Brute Shots. Enemies will tend to stick together, and not follow the player too far from their spawn point, making it very difficult to ambush them. Enemies will throw grenades more often, and if the player is behind cover they may continuously throw grenades until the player moves or is killed. One burst from the Plasma Rifle is enough to kill the player (Four to penetrate shields and three to kill). Enemies fire at a much faster rate and fire extremely accurately. Enemy numbers are drastically increased. Shields are 50% their Normal resistance and a few hits will drain them completely. The Arbiter's active camouflage lasts only five seconds and takes ten seconds to recharge. Enemy shields and health are almost double their Normal resistance. Virtually all Elites encountered are Majors. Grunt Majors are also far more common. Elite Ultras are now a very common sight. The player will encounter up to four in some parts of the game. They have the most powerful energy shields in the game and can survive an astounding four head shots from a Sniper Rifle or a Beam Rifle. When playing as the Master Chief, the player has to face large numbers of Elite Zealots. They always wield Swords and can slaughter large groups of Marines with ease. Enemies are extremely adaptive and intelligent in tactical action. They rarely fall victim to being outsmarted. Grunts retreat less often when a leader is killed. Marine allies are much stronger. They have more health and their AI is increased significantly. They are still highly vulnerable though. Melee attacks received from Elites and Flood combat forms are practically always one hit fatalities, however moving to the side will reduce the damage concurred from such attacks. Enemies normally have upgraded weapons. For example, Brutes that usually had Brute Plasma Rifles would now carry Carbines or have the deadly Brute Shot equipped. Enemies will often notice the player sooner and prove to be more alert. Jackal Snipers will appear more often than on any other difficulty. They can kill the player with only one shot regardless of where it hits. Players should think twice before sticking himself/herself out into the open. Stealth Elites appear more often and travel in groups of two to four, usually with one or two dual-wielding Plasma Rifles and the others using Energy Swords. Almost all Elite Combat Forms have shields. One shot from a Brute Shot will have the same power as a shot of the rocket launcher on Easy difficulty. The Legend achievement is awarded for completing the campaign on Legendary. The Hired Gun achievement is awarded for killing an opponent who has the Legend achievement in multiplayer. The Legendary Anniversary achievement is awarded for completing the campaign on Legendary. The Monopolized achievement is awarded for completing the campaign on Legendary in under 3 hours. The He's Running a Marathon... achievement is awarded for watching the Gravemind cutscene on Legendary in classic graphics. The Halo 3: ODST Legendary shield. Shields are 50% their Normal power and a few hits even from a Plasma Pistol will drain them completely. Enemies are much more resistant to damage. (E.g. The player needs three body shots or two headshots for a fully shielded Brute Captain to take it down instead of one headshot or two body shots with a sniper or beam rifle). Headshots are the only means to get a quick kill on enemies like Jackals and Grunts, aside from assassinations. Nearly all enemy forces are promoted by one rank. This can be changed with the effects of the Thunderstorm Skull, which promotes enemies even higher. In addition to this promotion, Brutes will not carry deployable covers. Enemy numbers double or sometimes triple in the case of Flood encounters. Enemy AI improves dramatically, enemy vehicles will be significantly harder to hijack and enemies will be nearly impossible to stick with grenades. Jackal Snipers, one of the rarer enemies in Halo 3, will appear with greater frequency, though not nearly as much as in Halo 2. Enemies fire much faster and more accurately, and toss grenades more often and with greater accuracy. Turrets, such as Shades, are frequently encountered, even in places in which they did not appear in lower difficulties. Gunners will also fire more aggressively. Brutes will wield Brute Shots more often. They will fire them faster and more accurately. They will also frequently go berserk. The "linked lives" system from Halo 2 is removed but can be achieved with the Iron Skull activated. Almost all Sentinels have shields, including allied ones. In single-player mode, the Arbiter is next to useless and will frequently be knocked out for prolonged periods. He will also take cover a lot more and so reduce his outgoing fire. However, he becomes a powerful ally if wielding an Energy Sword when fighting the Flood, especially in the level Floodgate. In the level Arrival, there are five different random dialog lines for Johnson which are exclusive to Legendary difficulty. The ending cutscene of the level Halo, following the game's credits, has a Legendary-only scene foreshadowing Halo 4. In the level Prepare To Drop, a photo of the Rookie's girlfriend can be seen in his drop pod. In the ending cutscene of the level NMPD HQ, blood sprays out of Romeo's chest. The ending cutscene of the game, at the end of the level Coastal Highway and after the credits, has a Legendary-only scene. The Campaign Complete: Legendary achievement is awarded for completing the campaign on Legendary. The Vidmaster Challenge: Annual achievement is awarded for completing the level Halo on 4-player Legendary LIVE Co-Op, with Iron Skull and everyone in Ghosts. The EOD armor is awarded in multiplayer for completing the campaign on Legendary. The Vidmaster Challenge: Classic achievement is awarded for completing any level solo on Legendary, on LIVE, with no shots fired or grenades thrown. The Vidmaster Challenge: Deja Vu achievement is awarded for completing the level Coastal Highway on 4-player Legendary LIVE co-op, with Iron Skull, and no Warthog or Scorpion. Veronica Dare is awarded as a playable Firefight character for completing the campaign on Legendary. Enemies' health varies from being 25% to 50% stronger than on Normal, depending on the mission. Enemy units deal much more damage, up to 50% more than on Normal. Enemies are always upgraded with at least one or two upgrades and attack the player's base earlier and with more units. When facing Flood units, player infantry units get infected at a faster rate. Extra enemy units which normally don't appear on lower difficulties are present: Shades, stationary Jackals and sometimes even Mega Turrets. In Flood missions, there are more Flood launchers, Spores and Growth Pods than usual. Beating the game on Legendary unlocks additional dialogue at the end of the last cutscene, played after the level Escape and the credits. The Detour The Great Journey achievement is awarded for completing the campaign on Legendary. The One and Done achievement is awarded for scoring the winning point in a game of Keepaway against Legendary A.I.s. The Halo: Reach Legendary shield. In Halo Reach, enemy AI and numbers will be scaled according to the number of players (i.e. the more players there are, the more enemies there are and the more intelligent each enemy AI is). Plasma projectiles travel faster than on other difficulties. Shade turrets fire and turn several times faster than physically possible by the player. Elite Generals appear more often, usually wielding Covenant heavy weapons. Elite Minors seldom appear; less than five are encountered in the entire campaign, with the exception of Banshee pilots. Similar to Elite Minors, very few Jackal Minors appear through the whole campaign. Data pads 10 to 19 are only found on Legendary difficulty. When playing the level The Pillar of Autumn on Legendary, Captain Keyes refers to Catherine Halsey by her first name, while he uses her last name on lower difficulties. The Gods Must Be Strong achievement is awarded for completing the campaign on Legendary. The A Monument to All Your Sins achievement is awarded for completing the campaign on Legendary solo. The Game, Set, Match achievement is awarded for completing a Firefight set on Legendary without dying. Carter's helmet is awarded for the player's Avatar for completing a level on Legendary without dying. The Halo 4 Legendary shield. The player will get an extended cutscene in Epilogue if the entire campaign is cleared on Legendary. Enemies deal more damage and are more resistant to damage, with Elites taking at least seven direct headshots from a DMR to lose their shields. Crawler Snipes are more dangerous as their built-in Binary Rifles almost always kill the player in one hit, regardless of where it hits. Promethean Knights' and Promethean Watchers' shields recharge much faster. Knights also throw Pulse Grenades even more often. The fourth campaign mission, Forerunner, has two Legendary-only easter eggs allowing the player to spawn nine Incineration Cannons and two Forerunner heavy weapons caches for use in the mission, respectively. The seventh campaign mission, Shutdown, has a Legendary-only easter egg that allows the player to spawn four Gravity Hammers for use in the mission. The ninth and final campaign mission, Midnight, has a Legendary-only easter egg that allows the player to spawn a second Gravity Hammer for use in the mission. The Legend of 117 achievement is awarded for completing the campaign on Legendary. The Lone Wolf Legend achievement is awarded for completing the campaign on Legendary solo. The A Legendary Episode achievement is awarded for completing all chapters in Spartan Ops Episode 1 on Legendary. The Crimson Alone achievement is awarded for completing a Spartan Ops chapter on Legendary solo. The Mark VI armor and the Legendary visor color are awarded in Infinity multiplayer for completing the campaign on Legendary. The Halo 5: Guardians Legendary shield. Enemies deal more damage and are more resistant to damage. Promethean Crawlers' tracking shots from their built-in weapons exhibit virtually pinpoint accuracy. Promethean Soldiers use slipspace translocation even more often to confuse their enemies and throw Splinter Grenades more often. Knight Commanders wielding Incineration Cannons fire charged shots even more often. The player will get a secret ending after the credits if the final mission is completed on Legendary. The Iron Skull, found in Glassed, can only be obtained on Legendary. The Flaming Knives on Osiris easter egg in the mission Osiris can only be triggered on Legendary. Near the Gateway, there is a dead Promethean Crawler. If the player teabags this Crawler 117 times in the same spot, 031 Exuberant Witness will be able to shoot gauss beams, extending her combat capabilities, which then makes her useful in the double Warden Eternal boss fight at the end of the mission. The Forging a Legend achievement is awarded for completing the campaign on Legendary. 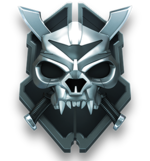 The Lone Wolf achievement is awarded for completing the campaign on Legendary solo. The Tank Still Beats Everything achievement is awarded for surviving Genesis all the way to the first Warden Eternal fight with the Scorpion still intact on Legendary. The Harbinger achievement is awarded for completing The Breaking on Legendary without all members of Blue Team dying. The Halo Wars 2 Legendary shield. Enemies are always upgraded at least one or two levels. Enemies often use Leader Powers to harass the player in the Campaign. Enemies do more damage than Normal. The Surviving the long war achievement is awarded for completing the campaign on Legendary. The Comrades in arms achievement is awarded for earning a gold medal on any mission (Except for the Prologue) on co-op on Legendary. The You've got a case of the Birley achievement is awarded for winning a 1v1 Skirmish match against Legendary AI, after recycling your base in the first five minutes. The Vidmaster Challenge: 100 drops achievement is awarded for gaining a gold medal and completing all objectives in Gatecrashers on Legendary. The Vidmaster Challenge: No fly zone achievement is awarded for gaining a gold medal and completing all objectives in Not on My Watch on Legendary. The We go feet first! achievement is awarded for completing Operation: SPEARBREAKER on Legendary difficulty. 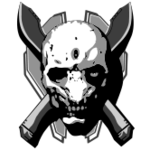 The Banished Prowess achievement is awarded for completing any level of the Awakening the Nightmare campaign on par time, on Legendary, with a scoring skull active. The The Ancient Enemy achievement is awarded for completing Awakening the Nightmare on Legendary. The Marathon symbol was present on every difficulty shield icon, but has disappeared in Halo: Reach and following games. Halo 3 and all subsequent FPS Halo games keep track of whether the player has finished Legendary on Solo or Co-op. Legendary was the title for the most expensive editions of Halo 3 and Halo: Reach. The second Halo 3 map pack is named the Legendary Map Pack. (Aptly named, for the previous map pack was the Heroic Map Pack and the next one was Mythic Map Pack). In Halo: Combat Evolved, if The Silent Cartographer is played on any difficulty higher than Easy, the guitar version of Rock Anthem for Saving the World will play after the transmission with Echo 419 after accessing the Cartographer. In Halo 2, Legendary is the only difficulty in which the player can find the hidden skulls, except for the Blind Skull and the Assassins Skull. However the Assassins Skull does not give the player the effect when not on Legendary. The Legendary symbol is visible several times in Halo Wars, on Sergeant Forge's and Red Team's armors. Legend achievement in Halo 2 Vista. Hired Gun achievement in Halo 2 Vista. Complete Complete: Legendary achievement in Halo 3. Promo of the Legendary Map Pack for Halo 3. Campaign Complete: Legendary achievement in Halo 3: ODST. Vidmaster Challenge: Classic achievement in Halo 3: ODST. Gods Must Be Strong achievement in Halo: Reach. A Monument to All Your Sins achievement in Halo: Reach. Game, Set, Match achievement in Halo: Reach. Living Legend achievement in Halo: Combat Evolved Anniversary. Brohammer achievement in Halo: Combat Evolved Anniversary. He's Unstoppable! achievement in Halo: Combat Evolved Anniversary. Overshields are for Sissies achievement in Halo: Combat Evolved Anniversary. Walk it Off achievement in Halo: Combat Evolved Anniversary. Tying Up Loose Ends achievement in Halo: Combat Evolved Anniversary. Tsantsa achievement in Halo: Combat Evolved Anniversary. The reveal of the Legendary shield in Halo 4. The Legend of 117 achievement in Halo 4. Career Milestone 100 on Halo Waypoint. ↑ The Halo 4 description is the same wording, however it ends with an exclamation point rather than a period.